Day One :Oh. 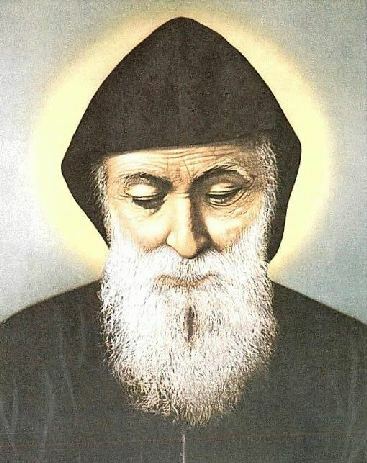 Miraculous Saint Charbel, from whose immaculate body, which overpowers corruption, radiates the scent of heaven, come to my rescue and grant me from God the grace which I am in need of ( name the grace). Amen. Oh, Saint Charbel pray for me. Oh Lord, who was bestowed on Saint Charbel the grace of faith, I plead to you to grant me through his intercession that divine grace to live according to your commandments and Bible. The glory is yours till the end. Amen. Day Two :Oh, Saint Charbel, Martyr of monastic life, who experienced suffering, and whom Lord Jesus made of you a bright beacon, I resort to you and ask through your intercession the grace (name the grace). I confide in you. Amen. Oh, Saint Charbel, vase of perfume, intercede for me.Oh, God of complete benevolence, who honored Saint Charbel by giving him the grace to perform miracles, have mercy on me and grant me what I ask from you through his intercession. (once) Our Father, Hail Mary, and Glory to the father. Oh, Saint Charbel, the amiable, who shines like a bright star in the church sky,brighten my way, and fortify my hope. From you I ask for the grace (name the grace). Ask for it from Jesus the crucified whom you perpetually worship. Amen. Oh, Saint Charbel, the example of patience and silence, intercede for me. Oh, Lord Jesus, who sanctified Saint Charbel and helped him to carry his cross, give me the courage to bear life's difficulties with patience and submission to your divine will through Saint Charbel's intercession, to you is gratefulness forever. Amen. (Once) Our Father, Hail Mary, and glory be to the father. Oh Father, Saint Charbel, the affectionate, I resort to you. My confidence in you fills my heart. With the power of your intercession with God, I am waiting for the Grace which I ask from you (name the grace). Show me your affection once more. Oh, Saint Charbel, garden of virtue, intercede for me. Oh, God, you, who granted Saint Charbel the grace of your resemblance, grant me the help to grow in the Christian virtues and have mercy on me to be able to praise you till the end. Amen. (Once) Our Father Hail Mary, and Glory to be the Father. Oh, Saint Charbel, loved by God, enlighten me, help me and teach me how to please God. Hurry to my rescue. Oh affectionate Father; I beg of you to ask God for this grace (name the grace). Oh, Saint Charbel, friend of the crucified, intercede for me. Oh, God hear my demand through Saint Charbel's intercession. Save my poor heart and give me peace. Calm the troubles of my soul. Glory to you till the end. Day Six :Oh, Saint Charbel, all powerful intercessor, I ask you to fulfill the grace which I am in need of (name the grace). A single word from you to Jesus is enough to forgive me, to have mercy on me and to grant me my wish. Oh, Saint Charbel, joy of heaven and earth, intercede for me. Oh, God, who chose Saint Charbel to defend us before your divine power, grant me through his intercession this grace (name the grace) to glorify you with him till the end. Day Seven : Oh, Saint Charbel, loved by everyone, helper of the needy; I have firm hope in your intercession before God. Fulfill this grace for me (name the grace). Oh, Saint Charbel, a star that counsels the bewildered, intercede for me. Oh, God, my numerous sins hinder your grace to reach me. Grant me the grace to repent. Answer me through Saint Charbel’s intercession. Return the joy to my sad heart and grant me my demand. You, the embodiment of graces, glory and gratefulness be to you. Oh, Saint Charbel, whenever I see you kneeling down on the cane mat, fasting, abstaining and absorbed in calling God, my hope and my faith in you augment. I beg of you to help me to receive the grace that I am asking for (name the grace). Oh, Saint Charbel, absorbed in God, intercede for me. Oh, Jesus, the most peaceful, you who has raised your beloved Charbel to biblical perfection, I solemnly ask you to grant me the grace to spend the rest of my life according to your demand. I love you, oh God, my savior. Amen. Oh, Father, Saint Charbel, here I am at the end of the Novena. My heart gets nourished when I speak to you. I have great hope that I will obtain from Jesus the grace I asked for through your intercession. I repent, and I promise that I will never ever fall into sin. I ask you to fulfill my demand (name the demand). Oh, Saint Charbel, crowned with glory, intercede for me. Oh, Lord, you listened to Saint Charbel’s prayers, and you fulfilled the grace of unison with you, have mercy on me in my moment of distress. Save me from malice which I cannot bear. Glory and gratefulness be to you till the end. Amen.